This is what I see using IE on Windows 10. No addons, etc. I was trying to find Skin Studio for a forum thread. Browser issue, Jim. Renders fine on Chrome & Brave & SKS is at the bottom right of the properly rendered page. I've had similar rendering problems with IE & FF on multiple sites. Hence my use of Chrome & Brave. Palemoon also renders it properly (they made a smart move when they quit the FF development path). That's weird, I am using Chrome and I don't see SKS anywhere on that page. Daiwa, did you go to the "learn more" page, and not the main ObjDesk page? The main Object Desktop page renders fine here too. But when I click learn more, I get the messed up page. Try my external link in the OP. Yup, it is fine in Chrome. SKS is there, but not clickable. 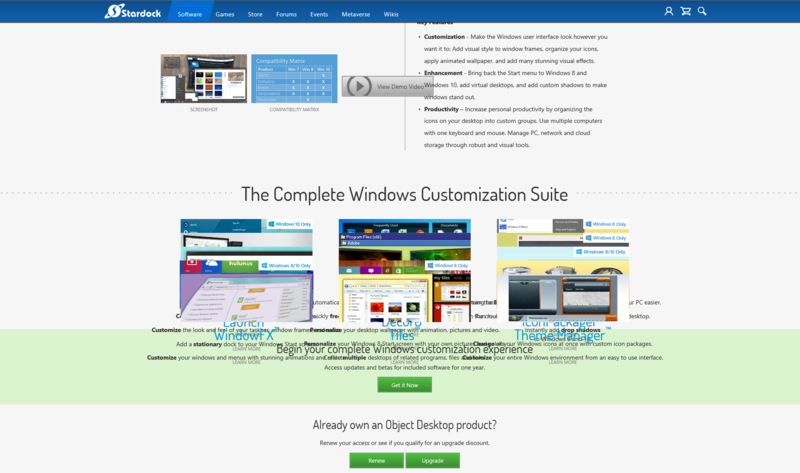 And if you go back to the main Object Desktop page and click on Skin Studio, you're taken to a page to buy WindowBlinds. Have been looking for this to help the same person as Jim I guess. Something has really changed for Stardock. Click on "My Downloads" The top one it says " Object Desktop Manager right under that it says "View Individual Downloads" click that. Now the list will come up. This use to be very easy to find but not so much now. Dave, his screenshot doesn't show that. And since he has WindowBlinds only, and not ObjectDesktop, I dunno if he'll see Object Desktop Manager. More than likely server issues that will be looked at when Stardock personnel return to work on Monday morning. I don't need to click "Learn more" Using your External link and IE, all I need to do is scroll down to the bottom of that page. Right Jim. My mistake. however even with OD it use to be very easy. You want to see how hard it really is try and do a search. I use to be able to just log into the store. No more. Yeah. The "learn more" is on the main ODNT page. Not on my external link. You're right, Jim. SKS is not on the ODNT 'Learn more' page. I was referring mainly to the rendering issue shown in your screencap. Also, no download link there. It looks like the StarDock page is stretched horizontally. Edit: I have SKS on My Download page. I didn't have to click anything (referring to Dave's comment). Yeah, Al. It's on my page as well. So maybe you can tell me what to do. How do you all get to your download page. I use to go here store.stardock.com and login. Now when I do that all I get is a page with all SD software on it with buttons under each saying "Buy Now"
Sorry Dave, late to the party. The way I did it was on the bottom of the StarDock page at the bottom under Support it says My Account.